Здесь представлена один из разделов четвертой главы каталога, сопровождавшего выставку работ художника эпохи Возрождения Фра Анжелико (15 век) в Музее искусств Метрополитен в Нью-Йорке в 2005 году. Каталог составлен кураторами этой выставки Лоуренсом Кантером и Пиа Палладино. About 1219, Saint Francis, accompanied by Brother Illuminato, sailed to Egypt and was granted an audience by Sultan al-Malik al-Kamil (r. 1218-38) at Damietta. Trying to convert the Saracens, Francis offered to walk through fire with any of the sultan's imams, as a demonstration of the power of his faith, but the offer was rejected and Francis was given a safe-conduct to leave Egypt. 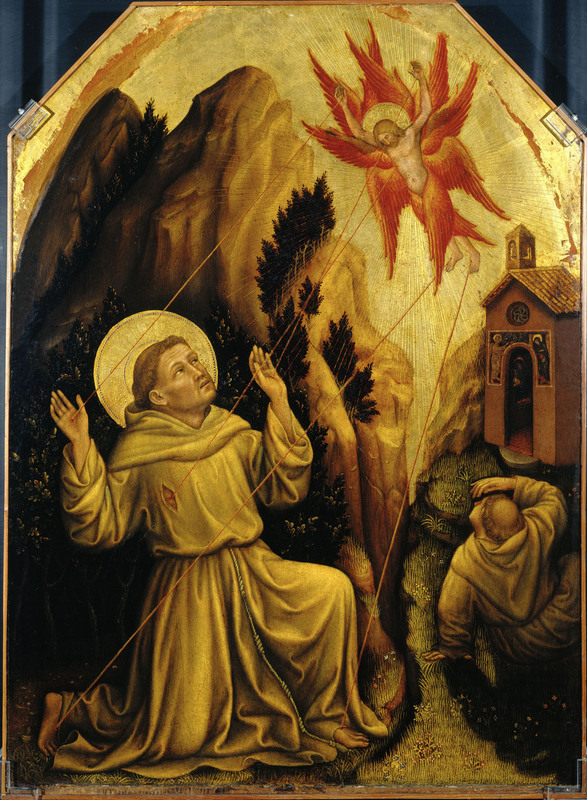 Having retired to the wilderness at La Verna, Saint Francis had a mystical vision in 1224, two years before his death, of a six-winged seraph, amid whose wings was the body of a man on a cross. Waking from his vision he found impressions of Christ's wounds, the stigmata, imprinted on his hands, feet, and side.Although Francis was alone at the time of the vision, it became customary in Italian painting to portray Brother Leo as a witness to the event. 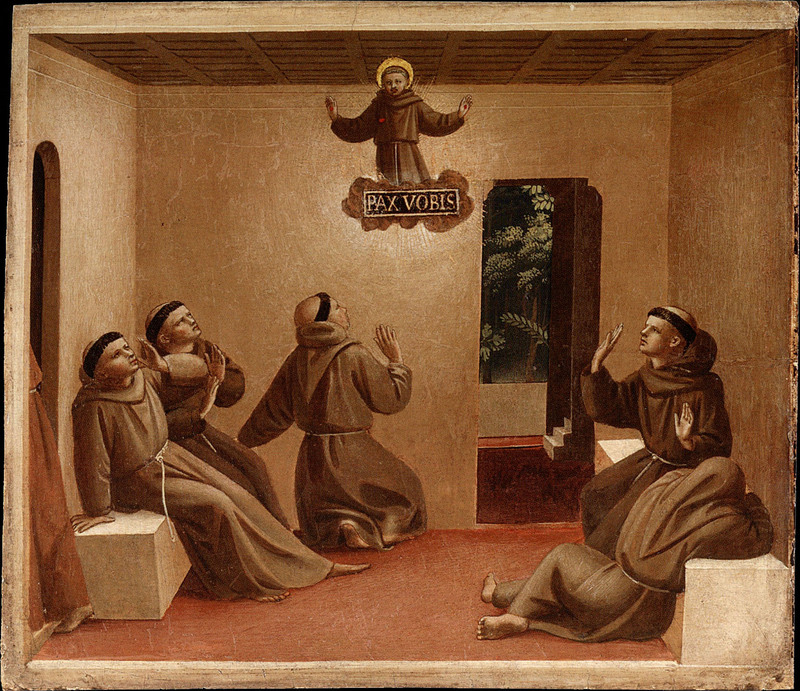 These two scenes were situated at the right and left ends, respectively, of a five-part predella dedicated to the life of Saint Francis of Assisi. 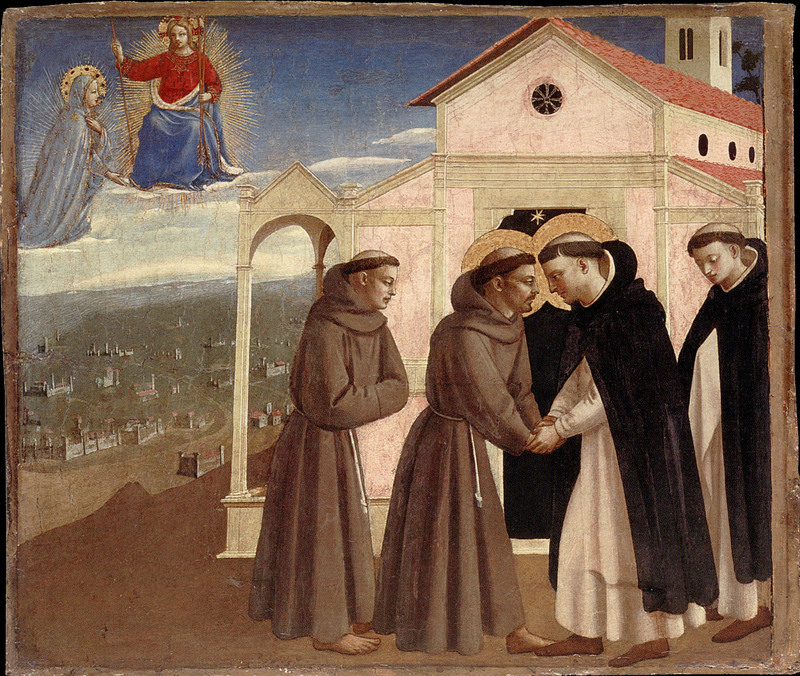 Second from the left, following The Stigmatization of Saint Francis, was a scene of The Meeting of Saints Francis and Dominic (26 x 31 cm; fig. 65). Fra Angelico scholarship has always recognized the interrelationship of these five panels, which, indeed, is self-evident. (*2) Opinions have differed, however, as to the attribution of the panels — to Angelico himself, to a member of his workshop, or even to a more distant follower — as well as to their dating. Frequently cited as works of the 1440s, an earlier date for them of about 1430 was proposed by Miklos Boskovits(*3) — an assessment that is certainly correct. Their meticulously accurate but reductively simple architectural backgrounds necessarily predate the scenes from the life of Saint Dominic on the predella of the Louvre Coronation of the Virgin altarpiece, painted about 1432-34. More closely than any other narrative panels by Angelico, these five recall the architectural structures in the Saint Lucy predella (cat. 25), dated here to about 1429-30, although they are at once less delicate and more ambitious. The figure types on the Saint Francis predella similarly indicate a date for those panels at the end of the 1420s, although, of course, by inference only, since no works from this moment in the artist's career are fully documented. The closest points of reference for these figures are to be found in such small paintings as the Detroit Virgin and Child, with Four Angels (cat. 20), or the Coronation of the Virgin reliquary from Santa Maria Novella, now in the Museo di San Marco (see cat. 28). 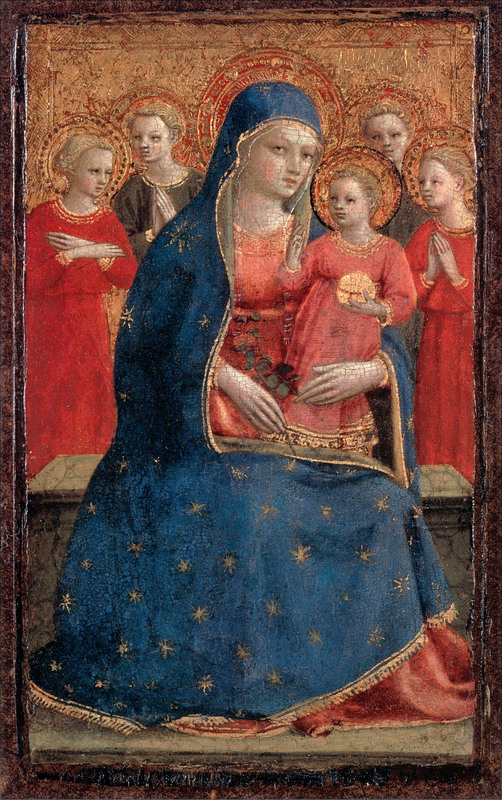 The unusually squat proportions of the figures in these paintings, with their generously scaled and well-rounded heads, are characteristic of Angelico's style for only a brief period in his career, beginning about 1425 with the predella of the Prado Annunciation altarpiece, and probably represent a conscious effort to emulate the more solid, sculptural figures introduced into Florentine painting in the preceding year by Masaccio. This affectation preoccupied Angelico for little more than four or perhaps five years, and was discarded by the time the artist painted the Cortona Annunciation altarpiece or the Louvre Coronation altarpiece in the 1430s. Various proposals have been advanced to identify the structure to which the Saint Francis predella originally might have been appended, including the late Bosco ai Frati altarpiece and the altarpiece to which the Pontassieve Madonna belonged. 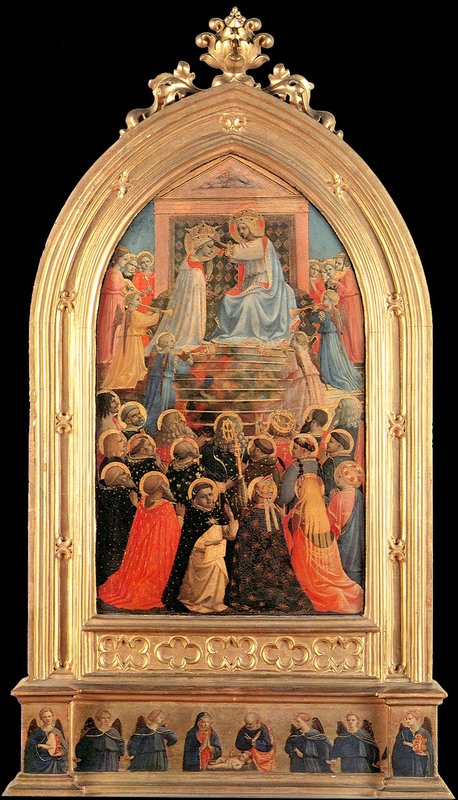 In 1976, Boskovits, instead, suggested that the central panel of this altarpiece might have been a painting in the Museo di San Marco representing the Virgin and Child Enthroned, with an image of the Trinity filling the pinnacle above them (fig. 68). To these he added two lateral panels of disputed attribution (formerly in the Certosa di Galluzzo and now on loan to the Museo di San Marco) that include full-length, standing figures of Saints Jerome, John the Baptist, Francis, and Onophrius, and, in the pinnacles, the Annunciation enacted by unusually large-scale figures of the Virgin and the archangel Gabriel. (*4) This reconstruction has not been universally accepted, but was reaffirmed by John Henderson and Paul Joannides on the basis of carpentry (two batten channels on the reverse sides align across all three of the main panels), scale, lighting, and iconography. (*5) The stylistic relationship of the main panels of this altarpiece and its putative predella is difficult to judge, not only because of differences in scale but also as a result of the severely damaged and repainted condition of the lateral panels and the fact that the Annunciation scenes in the pinnacles appear to have been painted by another hand. (*6) It can confidently be said of the San Marco – Certosa altarpiece, however, that it, too, must be a product of the late 1420s. There is no a priori reason, therefore, why it might not originally have stood above the Saint Francis predella and considerable circumstantial evidence to suggest that it must have done so. A more substantial contribution by Henderson and Joannides in their discussion of this complex was the publication of a notice of debt by the Compagnia di San Francesco — a penitential confraternity that met in a chapel in the cloister of Santa Croce; their declaration to the Catasto of 1429 referred to an unspecified amount of money owed to "Frate Guido the dipigne loro una tavola. "(*7) Given the coincidence of this document and the probable date of the Saint Francis predella and the San Marco – Certosa altarpiece, it is undoubtedly correct (although, admittedly, not irrefutable) to assume that the latter is the " tavola" for which the confraternity owed payment. This precious documentary evidence of Angelico's early activity is, however, only of approximate value, as it helps to establish a terminus a quo, not an exact date, for the Saint Francis altarpiece. It is not clear from this spare reference whether in 1429 the painting was already complete but not yet, or only partially, paid for; whether work on it was then in hand, and the confraternity was declaring its need to reserve funds to satisfy its contractual obligation; or, indeed, whether they had only just commissioned the painting and incurred the expense. 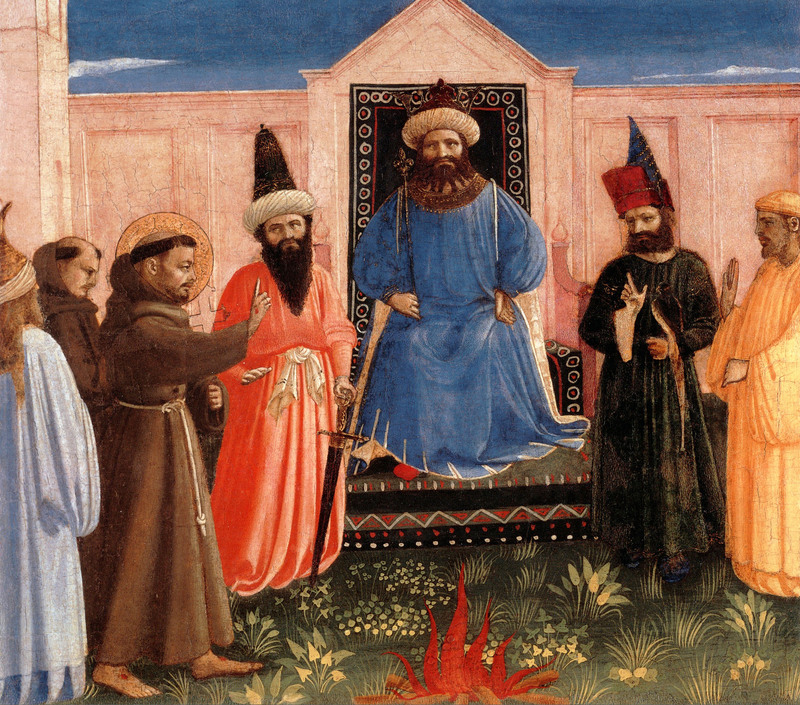 Several scholars have commented on the broad, relatively coarse rendering of the five panels of the Saint Francis predella, assigning their execution — if not their design — to assistants of Fra Angelico. Such a conclusion does not take into account the damaged state of all five panels, nor does it allow for the possibility, astutely raised by Henderson and Joannides, that Angelico deliberately may have chosen to work in a more severe style in accordance with the subject matter of this predella and the penitential simplicity of his patrons, the Compagnia di San Francesco. The intricacy of the composition of the predella's central panel, The Death of Saint Francis, leaves little doubt that Angelico himself was personally responsible for its invention, while the successful integration of figures and settings in surprisingly subtle combinations throughout the predella reveals the hand of the master at work on the painted surfaces as well. 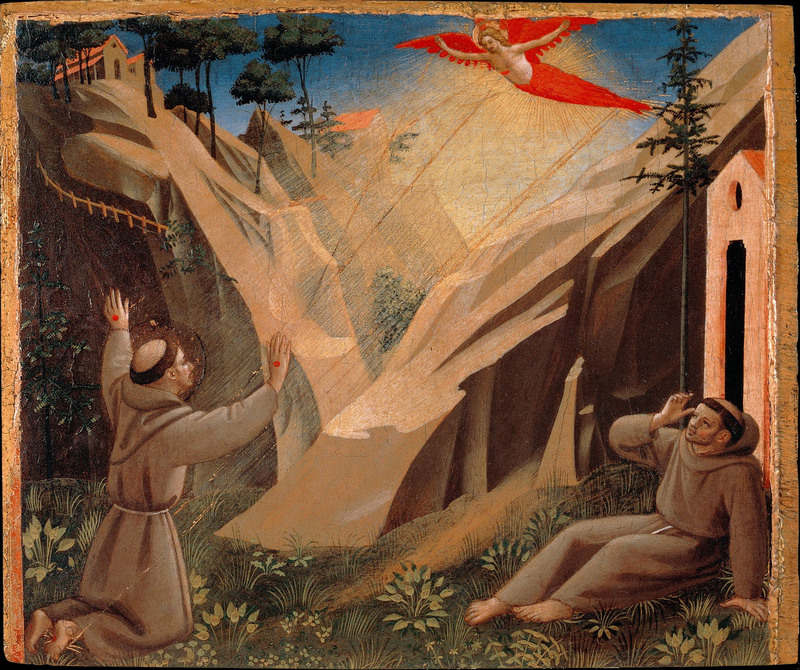 The effects of light in the Vatican Stigmatization of Saint Francis are particularly moving: a mystical radiance emanating from the seraph bathes the landscape in a pulsing glow far more persuasive as the agent of the miracle than are the traditionally drawn lines of light connecting the hands, feet, and side of Christ with those of the saint. Among his contemporaries, only Gentile da Fabriano and Masaccio had demonstrated a comparable interest in the naturalistic effects of illumination. Gentile's results, as can be seen in a painting of the same subject (fig. 69), seem to resemble more of a close study of objects perceived by candlelight than is Angelico's warmer, more expansive, and more richly imaginative depiction of a flood of supernatural light. Masaccio concentrated, instead, on accurately transcribing the effects of sunlight as a metaphor for divine intervention in human affairs—a rougher and more powerful approach to portraying the mystical and the spiritual than the elevated poetry embod-ied in Angelico's paintings. (*1). A. Labriola (in Boskovits 2005, p. 44) follows Pope-Hennessy (1952,p. 178) in proposing the predella sequence to have begun with the Meeting of Saints Francis and Dominic and the Apparition at Arles at the left and the Trial by Fire and the Stigmatization at the right.The sequence proposed here was established by Holger Manzke on the basis of X-radiographic study of the continuous wood grain of the panels. (*2). Schmalrsow 1897, p. 179; Schottmuller 1911, pp. 159-62,235; Baldini 1970, p. 103. (*3). Boskovits 1976b. pp. 37-38. (*5). Henderson and Joannides 1995, p. 4. (*6). This artist may have been Battista di Biagio Sanguigni. While it can be documented that Sanguigni and Angelico were friends for more than a decade before this, no other paintings earlier in date than this one show evidence that they collaborated or assisted each other — a pattern that becomes more common in the 1430s. Nevertheless, Sanguigni had moved to a house in the vicinity of San Domenico in Fiesole sometime before 1430, and there is no mason to suppose that the two artists might not have worked together before that date. (*7). Henderson and Joannides 1995, p. 3.The authors argued, correctly, that the reference to "Frate Guido" can only be understood to mean Angelico, called Fra Giovanni in religious orders but Guido di Pietro in secular life; he was the sole painter named Guido known to have been active in early-fifteenth-century Florence. Although not noted by Henderson and Joannides, Angelico is also called Frate Guido in the documents relating to the commission for the Linaiuoli tabernacle in 1433 (see cat. 29).